Charm and eloquence combined, plus his staunch stand against corruption boost the senator’s chances for the VP post. But he also has his fair share of critics. 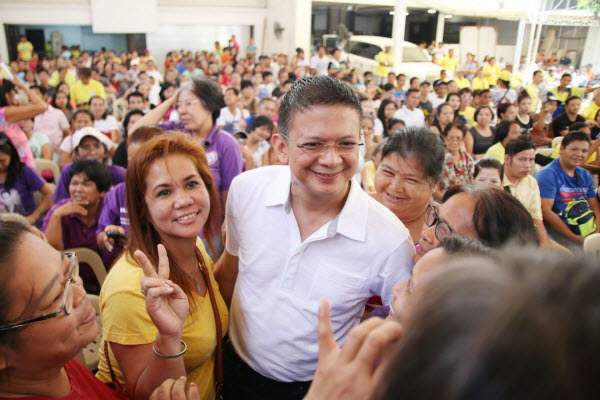 After a storied career as one of the youngest elected representatives at 28 and serving two terms in the senate, Francis Joseph “Chiz” Escudero is now vying for the second highest seat in the land. “I don't have the same pedigree of Quezon, Roxas, or Osmeña families, of those who have become presidents, heroes or wealthy philanthropists...And yet, I refuse to agree with those who say I have no right to have dreams or ambitions, especially if those dreams or ambitions are not for myself, but for our country and my fellow countrymen,” Escudero said in Filipino during his announcement for his candidacy in September 2015. The ambitious senator was not in the national public’s consciousness for so long, until he became the spokesperson of the late actor Fernando Poe Jr. during the 2004 presidential elections, a role the senator should thank for his vice presidential campaign today. His running mate, Senator Grace Poe, credits this very relationship their two families share as one of the biggest factors why the two are running as a pair, even when Poe had the option to run as Liberal Party’s vice president, to which many analysts said she could have easily won. A loyal Isko, Escudero attended the University of the Philippines from kindergarten to law school. Growing up with a father who served in Congress for more than a decade, Escudero may have been easily swayed into politics as he landed a seat as representative of Sorsogon at 28, one of the youngest to be elected in such position. During his time in Congress, he was one of the staunchest critics of the Arroyo administration and one of those who proposed for her impeachment. This anti-corruption stance continues until today, having admitted to have refused pork barrel as representative of Sorsogon. After his stint in the Poe campaign in 2004, Escudero has become a household name, thanks to his charm and noted eloquence in Filipino. By 2007, he was elected as the second most popular in the 2007 senatorial elections. Among the laws he authoredor co-authored are Republic Act (RA) 9504 (Tax Exemption for Minimum Wage Earners and Increased Tax Exemptions); RA 10158 (The anti-vagrancy law); RA 10353 (Anti-Enforced or Involuntary Disappearance Act); RA 9993 (Philippine Coast Guard Act); and RA 9745 (Anti-Torture Act). There were talks on his supposed run to be the youngest elected president of the country, but opted not to continue. Instead, he supported now President Benigno Aquino III and Vice President Jejomar Binay in the 2011 elections. But Escudero is not without critics, in 2013, he appeared to be second poorest seating senator after he declared P4.02 million ($85,875.07) worth of income in his Statement of Assets Liabilities and Net Worth (SALN), but critics questioned his lavish wedding with actress Heart Evangelista in the private island of Balesin in 2015. To which Escudero always maintained that his wife Heart is “much richer” than he is. Recently, Escudero is being criticized for his way of speaking. During the first vice presidential debate on April 10, some analysts called him “safe” with netizens poking fun on his “robotic” voice. “I’d rather be called on for my tone of voice than be called stupid or thief. I guess that’s better because they can’t criticize anything else,” Escudero said in an ambush interview on April 11. Now halfway through his second term as senator, Escudero is in the running once more, this time, to serve second to the president. The Poe-Escudero tandem vows to keep a compassionate government, amid their biggest opponents. According to the latest Social Weather Stations (SWS) survey, Mayor Rodrigo Duterte surged 12 points ahead of Poe while Senator Bongbong Marcos and Representative Leni Robredo are now leading in the vice presidential polls. “If we minimize discretion, we will minimize corruption. 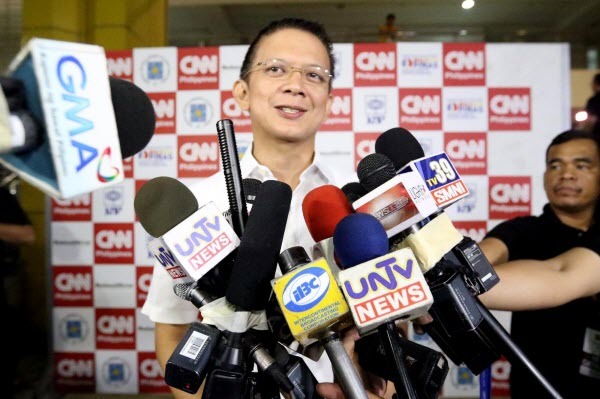 Some of the measures we can have are in the [Bureau of] Customs, we will replace their uniforms with ones without pockets and their office tables should not have drawers,” Escudero said in Filipino at the first vice presidential debate on April 10. Escudero and Poe are also one of the most vocal supporters of the Freedom of Information bill which aims for transparency and accountability of the government to its respective constituents. Among the candidates, the tandem is the only one who campaigns for stable Internet connection for the country, with Escudero hoping for more digitally-enabled government. “If those in the province can apply for government permits and documents online, then they wouldn’t need to travel all the way to Manila just for that. Doing things online can also mitigate the traffic problem,” Escudero said in Filipino at the first vice presidential debate. Escudero said in the second vice presidential debate held 17 that their tandem put an end to contractualization, or employment practice of limiting workers to short-term contracts than hiring them permanently and paying them benefits. They would also give P1-billion to each province and push for 100% Philhealth coverage ($21.36 million), along with free state college and university education. Entrepreneur Philippines profiles the leading presidential, vice presidential, and senatorial candidates in the upcoming May 9, 2016 elections. We aim to help voters know these candidates through their platforms focusing on the economy, entrepreneurship, tax reform. Elyssa Christine Lopez is entrepreneur.com.ph's editorial assistant/writer. Follow her on Twitter@elyssalopz. Entrepreneur.com.ph profiles the leading presidential, vice presidential, and senatorial candidates in the upcoming May 9, 2016 elections. We aim to help voters know these candidates through their platforms focusing on the economy, entrepreneurship, tax reform.